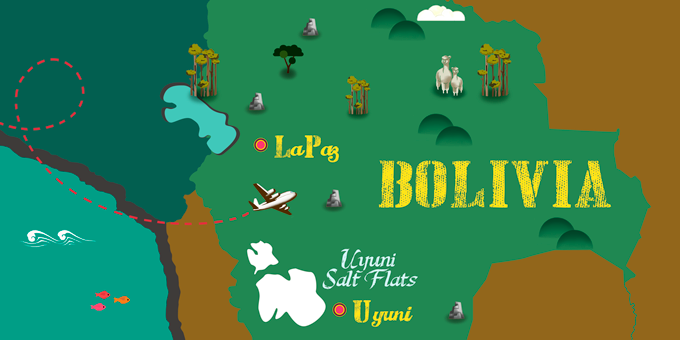 Due to the mix of ancient indigenous cultures and the traditions of Catholicism, Bolivia plays host to a wide array of festivities throughout the year. 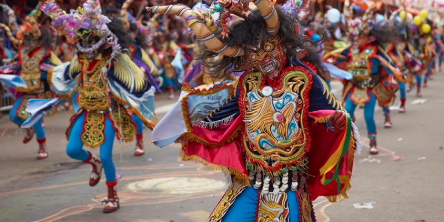 From astrologically based New Year celebration in the ruins of ancient Inca cities, to pious religious ceremonies in honour of holy figures, all of Bolivia’s festivities are delightfully joyful and colourful, with a big emphasis on costumes, masks and dance. Communities come together for many celebrations and street parties are a common occurrence, with tourists and visitors almost always being welcome to join in the fun. In Bolivia, Santa Semana marks a week long celebration in the run up to Easter Sunday and it is a celebration that is enjoyed throughout Latin America. One of the most eye-catching celebrations of the week are the Palm Sunday, or Domingo de Ramos, processions, where huge parades pass through the streets, laying palm throngs along the ground. On the Thursday of the following week almost all the churches and cathedrals in Bolivia open their doors to the public; a great opportunity for visitors and tourists to discover the interiors of some of the numerous beautifully decorated churches throughout the country. Good Friday is marked by a delicious 12-course meal enjoyed by all devotees and shared with families and friends. The festival ends on dawn of Easter Sunday, where followers pray and give thanks to God. Probably the biggest celebration and a national holiday in Bolivia, the festival of Aymara new year marks the winter solstice in the Southern Hemisphere. Aymara are an indigenous population concentrated in the south and west of Bolivia and the tradition of celebrating their New Year goes back many centuries and is something deeply rooted in the culture of the country. The most prominent destination to celebrate the coming of the New Year is the ancient Inca site of Tiwanaku, where followers gather in their thousands to watch the sun rise over the ancient megalithic structures. This catholic festival, which celebrates the biblical figure of St. John the Baptist, is traditionally celebrated by lighting huge bonfires and burning in the flames items which are no longer needed. Nowadays, due to safety concerns, bonfires are not so common in Bolivia, but instead almost everyone heads out into the streets to celebrate with loud and colourful fireworks and by lighting barbeques to cook food to share amongst the community. Wherever you are in Bolivia on the night of San Juan, you can expect to see lively street parties and celebrations. In the usually tranquil town of Oruro, located on the vast Bolivian altiplano a world famous festival erupts into celebration every February or March. It is a popular festival with travellers, who make their way to this isolated town to join in with the lively dancing, exuberant costumes and to enjoy the party, which, some years, goes on for almost 20 hours! As well as the boisterous celebrations, artisans take the opportunity to set up their stalls to sell their crafts so it’s the perfect place to pick up an authentic souvenir to remember the wonderful celebrations at Oruro. Every year, thousands of Bolivians, tourists and visitors make a pilgrimage to the sparkling shores of vast Lake Titicaca and to the nearby village of Copacabana to celebrate this holiday, which merges both traditional Catholic beliefs with ancient Andean traditions. According to folklore, the Virgin Mary is said to have saved fishermen caught in a storm on Lake Titicaca, and this celebration is to give thanks to her. The three-day festival consists of religious processions, prayers and delicious traditional food is served for the pilgrims in the streets. This religious festival is celebrated in honour of Jesus and the most festive celebrations can be found in the huge metropolis of La Paz. Visitors are treated to a sea for colourful costumes and intricate masks as thousands of dancers compete with each other in the street to give thanks to Jesus.It is considered the largest of all religious festivals in Bolivia and the whole of La Paz comes to a standstill as everyone gets involved in the celebration.